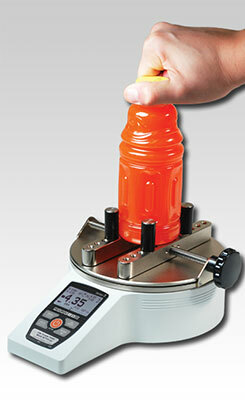 Series TT01 Cap Torque Testers are designed to measure application and removal torque of bottle caps up to 100 lbFin [11.5 Nm]. Adjustable posts effectively grip a broad range of container shapes and sizes, while optional flat and adjustable jaws are available for unique profiles. A rugged aluminum design, and simple, intuitive operation allow for use in laboratory and production environments. Class-leading accuracy of ±0.3% and blazingly fast sampling rate of 7,000 Hz ensure reliable and consistent test results, even in quick-action applications. Password protection is provided to prevent unauthorized changes to settings and calibration. The TT01 includes a range of sophisticated productivity-enhancing features, including USB, RS-232, Mitutoyo, and analog outputs, automatic data output and zeroing upon cap removal, memory storage for 1,000 readings, pass/fail indicators and outputs, and more. First / second peak torque detection is useful for measuring slip and breakaway torques for tamper evident closures. Series TT01 testers include MESUR™ Lite data acquisition software. MESUR™ Lite tabulates continuous or single point data. Data stored in the TT01’s memory can also be downloaded in bulk. One-click export to Excel allows for further data manipulation.